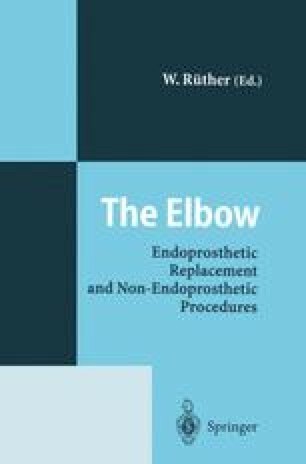 Advances in surgical technique and implant design combined with the recognition of the importance of restoring the anatomic relationships of the elbow have led to a decreased complication rate associated with total elbow arthroplasty. However, when failure do occur it may lead to a very complex situation. The surgical solutions for the failed total elbow replacement are usually extremely challenging with high complication rates. The options range from implant removal with resection arthroplasty to revision total elbow arthroplasty to even amputation in severe cases. When faced with a failed total elbow replacement, the surgeon must understand the failure mode, evaluate the remaining soft tissues, bone, and neurovascular status, and then individualize the treatment option for the patient.